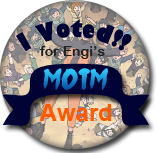 [Sand] Reignbows: Rain of Terror - Engi no Jutsu - The Best Naruto RP on the Net! After a harrowing battle with a devious, rainbow colored dragonfly leaves Wisp and Tento empty handed, the boys keep on their search for the elusive D O U B L E R A I N B O W. They are assisted by Hikiboshi no Matsu, a miko with a mysterious past! Together they enter a funhouse of horrors where up is down, left is right, and clean wholesome family entertainment is worthy of a censor bar. Oh, and they kill the monster. That happens too. The transition between the final few posts of the previous thread and the opening few posts of this thread was excellent -- from the alterations of the deal and the village's "phone-a-friend" while Tento sleeps, to Tento's innocence contrasted against "Wisp's" experience, to Consulting-Foxgirl's arrival on the scene, you three each set the scene and stage in a great way. It had me thinking, wow, the last thread was really well done too -- surely they can't keep the pacing this solid and the characterization so strong. The hooks you established both in Part 1 and in the opening of Part 2 carried very well throughout. Admittedly a little bit of the cohesion felt lost after that first round, as they traveled towards the objective in the wagon. I suppose it's natural for that to happen, at least as far as Engi is concerned -- when you've got three characters trying to interact with eachother all at once, dialogue tends to suffer because it becomes that much harder to maintain a back-and-forth between all three of them simultaneously. Something I've tried to make a concious effort to do, in those situations especially, is just take the L when the order doesn't enable me to sensibly and tactfully slide in my own character's dialogue without disrupting the flow of the narrative (unless it's like an arc-thread or open-thread scenario where this matters less and the order can be adjusted to accomodate). I would also point out that trying to plan out a thread ahead of time, specifically discussing dialogue and the progression of the plot, can go a long way! And you did manage to keep the characterization burning bright throughout the thread; even while Tento was unconcious/incapacitated, he was represented well. The last thought in his mind was how amazing the woman smelled covered in his blood"
Ending wrapped everything up nicely. For IC-purposes: Sunagakure has collected their payment and this mission has been deemed an official success. Wisp is a kid, and Tento hasn't really worked with him before, so when Tento (in-character) says things like "the man known as Wisp" it feels too meta for my tastes. Try to see through the eyes of your character as much as possible while writing them! But, I do think that "as the words of the wisp..." sounds poetic, and in a good way. This post's missing dialogue color! 3 for Wisp, 3 for Natsu (+ whatever Bijuu bogus stuff, yum), 2 for Tento (and access to jutsu should your hearts desire it). Last edited by Seikon; 01-27-2019 at 06:21 PM..
>:| I think references to Dracula style vampire folklore and movies make as much sense to jeans-wearing radio-listening e-mail using shinobi. Just, yanno, sayin'. Natsu will take Stage 3 of her Pierce powers. Bijuu takes 2 XP, one for thread, one for eating one. Like a vampire. 06/10. Last edited by Seikon; 01-27-2019 at 06:30 PM.. I said two points, two points! Thanks for the rating, especially since this thread was scrampacked with posts and illusion nonsense. Your diligence will not go unrewarded, though I hope you like character sheet edits as a reward since that's all I can give you. Last edited by Seikon; 01-28-2019 at 07:09 PM..
Yea, it was meant to say that he was greedy. Thank you, I am really feeling like Tento will be my best rp character. Now time for some spiders. Last edited by Seikon; 01-28-2019 at 07:07 PM..